I have a quick question about his hair regrowth. My chow recently had a summer cut and his hair is growing back just fine excluding the part where the harness is located. The harness is not on him that much maybe 1-2 hours a day at most so I don't understand why there are bald patches. The undercoat is growing but not the top coat, any suggestions to remedy this? 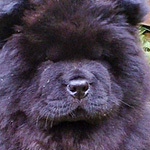 You don't need a harness for a chow chow, they have very strong necks so try using a leash instead. It may take a long time for that hair to grow back. Keep the harness off! I beg to differ on that one. My chows all have thicker necks than heads and only have to fling their head in the air whilst behind me to remove their collars how ever tight they are. Collars are a no no in our house except when showing. Other than that they go everywhere on harnesses. Whilst two of them are ok off lead the other definitely is not and none have any road sense at all! You could check the edges of the harness for hard edges. Some nylon ones are surprisingly sharp and cut through the coat. I hope you find an answer to the problem.